The Azure SignalR Service is a serverless offering from Microsoft to facilitate real-time communications without having to manage the infrastructure yourself. SignalR itself has been around for a while, now the hosted/serverless version makes it even easier to consume. There are also Azure Functions bindings available that make it easy to integrate SignalR with Azure Functions and end clients. This means that any Azure Function with any trigger type (e.g. 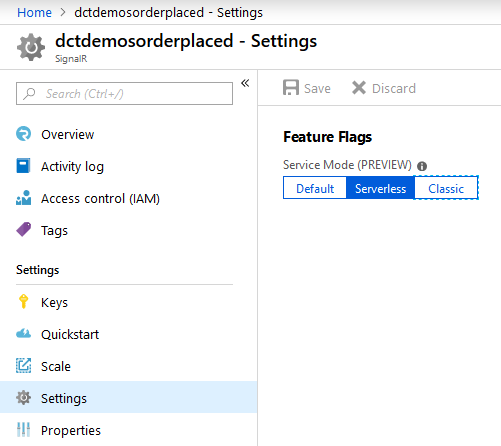 Azure Cosmos DB changes, queue messages, HTTP requests, blob triggers, etc.) can push out a notification to clients via Azure SignalR Service. In this article we’ll build a simple example that simulates the “someone in Austin just bought a Surface Laptop” kind of messages that you see on some shopping websites. After logging into the Azure Portal, create a new SignalR Service instance (search for “SignalR Service”) – you can currently choose a free pricing tier. Give the new instance a name, in this example the instance was called “dctdemosorderplaced”. Once you’ve filled out the info for the new instance (such as resource group and location) hit the create button and wait for Azure to create the new instance. In Visual Studio (or Code) create a new Azure Functions project. "AzureSignalRConnectionString": "PASTE YOUR SIGNALR SERVICE CONNECTION STRING HERE"
[Table("Orders")] IAsyncCollector<Order> orders, // could use cosmos db etc. The preceding function allows a new OrderPlacement to be HTTP POSTed to the function. The function saves it in table storage and also adds it to a storage queue. This function will be automatically called from the SignalR client code as we’ll see later in this article. Notice the function returns a SignalRConnectionInfo object to the client. This data contains the SignalR URL and an access token which the client can use. Also notice that the SignalRConnectionInfo binding allows the SignalR hub name to be specified, in this case “notifications”. 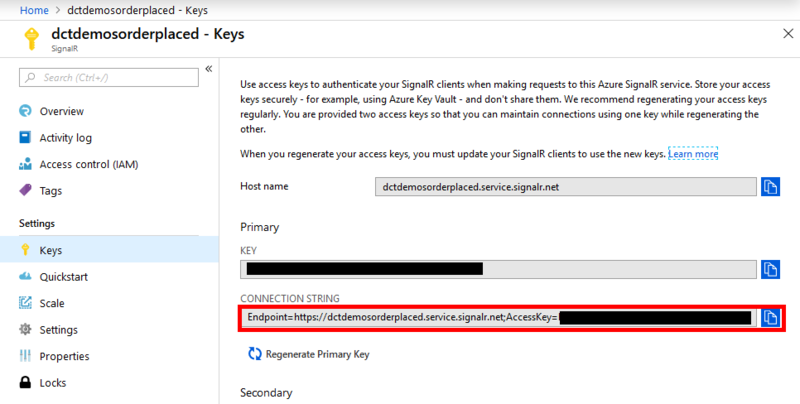 Now the client can negotiate a connection to the Azure SignalR Service via our Function App. The preceding function is triggered from the queue (“new-order-notifications”) that the initial HTTP function wrote to, but you can send SignalR messages from any triggered function. Notice the [SignalR(HubName = "notifications")] binding specifies the same hub name as in the negotiate function. To send notifications, you can simply add one or more SignalRMessage messages to the IAsyncCollector<SignalRMessage> In this function, the arguments contain the OrderPlacement object. The client will then be ale to access the customer name and product and display it on the website as a notification. Create a new empty ASP.NET Core project and add a default.html file under wwwroot. This example does not require any server-side code (controllers, etc.) in the demo web site, so a simple static HTML file is sufficient. The .withUrl('http://localhost:7071/api') line is the root of your locally running Azure Function development runtime environment. Right-click the solution in Visual Studio and select “Set Startup Projects…” and choose Multiple startup projects and set the Function App project to Start and the ASP.NET core project to Start without debugging. This just means you can hit F5 and both projects will run. This will save the order to table storage and add a message to the queue. The queue-triggered function will pick up this message an send a notification to the client and you should then see “Amrit just ordered a Surface Book” appear on the web site. Note that this demo application allows anonymous/unauthenticated clients to access the functions and the SignalR Service, in a real-work production app you should ensure you secure the entire system appropriately – see docs for more info. You can find this entire sample app on GitHub.